Investors could be vastly underestimating the prospects of this defense contractor. Up 34% over the past 52 weeks already, Oshkosh (NYSE:OSK) stock could be ready to surge some more. If Deutsche is right about its predictions, then new buyers stand to earn about 12% more profit on Oshkosh stock, too, and collect a 1.4% dividend yield along the way. But is Deutsche right? 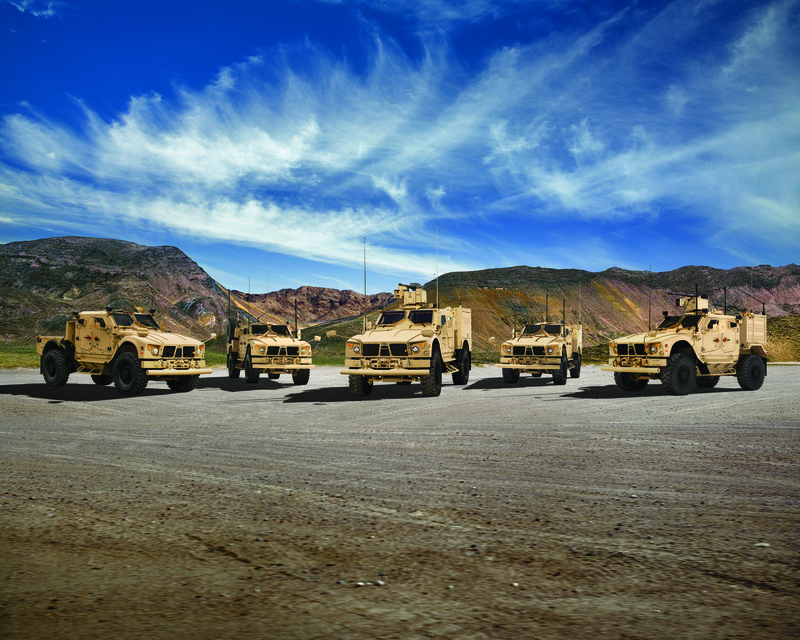 Oshkosh makes MRAPs (mine-resistant ambush protected vehicles). Lots and lots of MRAPs. Image source: Oshkosh Corporation. As it turns out, Deutsche Bank has just initiated coverage of a whole raft of industrials stocks. According to StreetInsider's report, everyone from Allison Transmission all the way up through WABCO Holdings got a new rating last night -- nearly literal A-to-Z coverage. Most of these stocks, however, received only "neutral" coverage, as Deutsche put them on its radar for future monitoring, but declined to give an affirmative buy/sell recommendation. The exceptions included just a handful of big names, such as Cummins (NYSE:CMI), rated a sell; Caterpillar (NYSE:CAT), rated a buy; and of course Oshkosh, which Deutsche says "has the most robust four-year outlook in our coverage universe." Priced at 20.4 times earnings, Oshkosh slots in somewhere between Cummins, with a price-to-earnings ratio of 16.2, and Caterpillar, at 55.4, on the valuation scale. But clearly, with Deutsche recommending that investors buy Caterpillar at 55 times earnings, but sell Cummins at only 16 times earnings, simple P/E valuation isn't the only thing that Deutsche is looking at in assigning its ratings. Rather, Deutsche is looking for stocks that it thinks will grow their earnings rapidly. And according to the analyst, that's what really sets Oshkosh apart: its growth prospects. Whereas Wall Street is forecasting only low-double-digit earnings growth at Cummins and Caterpillar, "we forecast a 6% and 23% revenue and EPS CAGR over 2016-20e, respectively," says Deutsche. And how is it that Oshkosh, a company most people think of as a maker of forklifts, aerial construction platforms, fire trucks, and ambulances, is actually a growth stock? As Deutsche explains, Oshkosh's secret weapon is its defense business, which builds MRAPs for the military, and is currently engaged in a massive effort to upgrade the Army's Humvee fleet with new Joint Light Tactical Vehicles. "The bulk of [Oshkosh's growth] strength will be driven by Defense," says Deutsche, "where the company will benefit as Joint Light Tactical Vehicle (JLTV) shipments to the US DoD ramp up." And while most investors are by now aware of Oshkosh's JLTV contract win, the analyst says "we do not believe consensus is properly modeling the margin mix benefit" that Oshkosh will enjoy from increased defense revenue. Deutsche predicts fiscal 2017 earnings 9% higher than what the rest of Wall Street is expecting from Oshkosh, with profit margins from the defense business rising 40 basis points (i.e., 0.4%). And as the analyst points out, in addition to the JLTV business, Oshkosh is working on a big order for "1,000 international Mine Resistant Ambush Protected" vehicles earning "midteens margin" -- and may win additional MRAP orders on top of those. And all of this, in Deutsche's estimation, works out to a stock trading for 20.4 times earnings, but growing at 23%, paying a 1.4% dividend, and thus producing 24.4% annual total return for investors -- a 0.84 total return ratio, in other words, and a valuation that's arguably very cheap indeed. So where could Deutsche go wrong? Well, I see two flaws in the argument. First, Oshkosh's earnings aren't quite as high quality as I'd ordinarily like to see, with free cash flow for the past 12 months coming in at just $150 million. Versus $205 million in reported GAAP earnings, that works out to Oshkosh earning cash profits of just $0.73 per $1 in GAAP reported profit. And second, while Deutsche Bank thinks Oshkosh can grow earnings at 23%, Yahoo! Finance figures have most analysts predicting earnings growth of less than 6% -- 5.87% to be exact -- and an actual out-and-out earnings decline this year. Long story short: Predicting earnings growth four times faster than what anyone else is expecting to see, Deutsche may be right about Oshkosh outperforming expectations. And if it is right about the growth rate, it's going to catch a lot of investors by surprise.